Aurelia takes its name from the soft golden light emitted from its graceful light hub, which can be equipped with your choice of light bulbs. The Air Circulator's pleasant and uniform glow washes its surrounding in peaceful warmth. Its five elegant walnut finish blades are designed to spread air consistently and evenly to the space around it. Working whisper quiet the Aurelia has a certain je ne sais quoi beauty that subtlety adds grace to its surroundings. Its unique multi-headed light hub can be equipped with your choices of light bulbs - CFL or LED. Use an incandescent to emanate a pleasing warm glow, or LED to wash your surroundings with serenity. 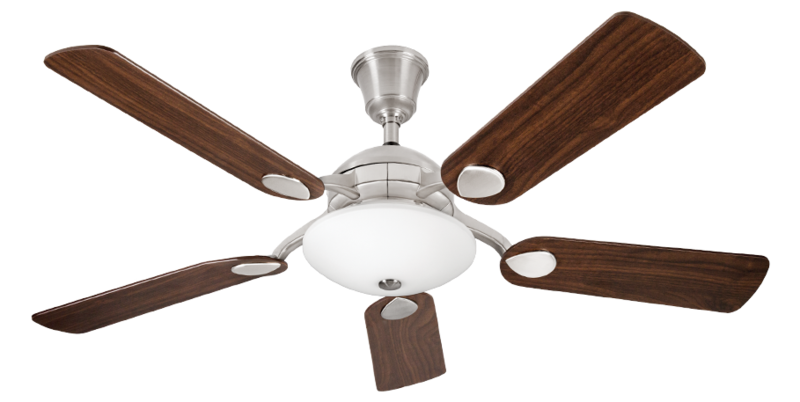 Specially designed five blades in elegant Walnut finish spread air consistently all around. Its space and surroundings. Its five blades make the air flow more smoothly and quietly to create a more pleasing environment, operating at 50 Dolby. To keep your experience pleasant the advanced motor, along with the smooth movement of its five blades make the fan whisper quiet, reducing ambient noise in your treasured space, by operating just at 50 Dolby. The robust build quality of our advanced motor inspires us to provide you a 10 year warranty.